Patients with schizophrenia have been hypothesized to have a functional impairment in filtering irrelevant sensory information, which may result in positive symptoms such as hallucinations or delusions. Many evidences suggest that abnormalities in the event-related brain potentials (ERPs), resting state electroencephalography (EEG) and synchronized oscillatory activity of neurons may reflect core pathophysiological mechanisms of schizophrenia. Abnormalities in amplitude and latency of the ERPs reflecting aberrations in gating and difficulties in the detection of changes in auditory stimuli, as well as defects in stimuli evaluation and integration of information are common in patients with schizophrenia. 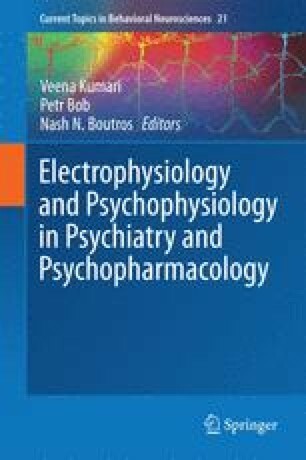 This chapter highlights the findings of electrophysiological studies in schizophrenia dealing with early sensory perception and attention, automatic sensory detection of stimuli changes and cognitive evaluation and integration of information, relevant to the pathophysiological mechanisms underpinning hallucinations and delusions. Results of electrophysiological studies investigating the neural correlates of positive symptoms suggest aberrant intrinsic organization of functional brain networks.